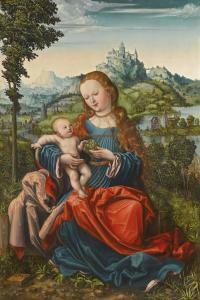 Find artworks, auction results, sale prices and pictures of Master Piasecka Johnson Madonna at auctions worldwide. Acquired from the above in 1981 by the present owner. Warsaw, Royal Castle, Opus Sacrum, 10 April – 31 July 1990, no. 20. 86 by 58.5 cm. ; 33 7/8 by 23 in. The following condition report is provided by Sarah Walden who is an external specialist and not an employee of Sotheby's: Lucas Cranach the Elder. Madonna and Child. Dated 1522. This panel has one central joint. It has been cradled probably in the middle of the last century, and although the faintest trace of curves between cradle bar lines can be seen in a raking light in some places, the cradle has not caused any marked reaction in the original wood, which is remarkably well preserved with no past worm damage. The outer edges of the panel have a narrow unpainted band with some residual priming, from the original structure holding it on the easel. The extraordinary preservation of this painting suggests an exceptionally peaceful, stable background and early history. There has been a recent restoration, with minimal retouching. The central joint has evidently been reglued and there is a band of careful retouching down its full length including the Madonna's eye on the left. Elsewhere however scarcely any other retouching can be seen under ultra violet light. There is one narrow slanting line presumably an old crack or scratch (about five inches long) at the top of the sky on the right, with one other tiny scratch by the horizon on the left. Several brief little old cracks come up from the base edge near the centre on either side of the central joint. There are also one or two surface retouchings in the red drapery at lower right. But these are negligeable imperfections in a quite exceptionally intact painting. The craquelure is extremely fine throughout and the surface has remained crisply defined and pure down to the smallest detail. Within the landscape each leaf is unworn and luminous, as is the beautifully glazed drapery throughout. This report was not done under laboratory conditions. "This lot is offered for sale subject to Sotheby's Conditions of Business, which are available on request and printed in Sotheby's sale catalogues. The independent reports contained in this document are provided for prospective bidders' information only and without warranty by Sotheby's or the Seller."